Without a great outpouring, nothing will be done. How Can We Ignore This INJUSTICE for Decades? for nearly 10 years now. who were essentially the mothers. God is my witness - this needs addressing! I shall NEVER forget them. Society appears unable to plan the progress of correction, because it makes conflicting and contradictory demands. Society expects men to be punished severely for their crimes, so that others will be deterred from committing them. Yet society also wants men to be rehabilitated while in prison, so they might return to useful positions in the community. To oversimplify: society wants men to be taught to use liberty wisely while deprived of it. The following is not merely on the contribution to the over-costing of the TDCJ prisons, it addresses two injustices regarding Certainty in Parole and Staff Experience Access: here is how, 1) adding 1% of Certainty to the current 100% of Uncertainty to the freedom of parole eligible offenders; and 2) Staff Experience Access to over 100,000 years of in-prison daily face-to-face experience with offenders. In addressing these two injustices together, these will also concomitantly and simultaneously introduce unprecedented vitality and management control fostering both positive inmate behavior and rehabilitation and contributing to the hope in inmates, in their families, and to the morale of prison staff. Yes, 100,000 mothers want certainty, if at least 1% of Certainty among the current 100% of Uncertainty. Each Individual Prison by nominations from Department Heads, Supervisors, and Officers in mutual consultation grants parole to 1% of their Parole Eligible Offenders for five years – herein called the 100,000 Mothers’ Parole Option. This would free about 1,500 beds each year, above the current releases, 1% of TDCJ’s 150,000 offenders, and, ironically is nearly 1% of the of the Board of Pardon and Parole’s (BPP) 110,000+ denials each year. That saves an additional $10’s of millions with one small law or change in the constitution. The rationale is simple: 1) the injustice of 100% Uncertainty is grave, 2) no one knows the inmates better than the Prison Staff, and 3) the no one cares for the inmates like their mothers and grandmothers. Give Texas Moms “1% Certainty” via the Prison Staff’s choice of 1% based on behavior. 1. Texas’ Family Values LIFTED. A constant source of natural human frustration exists among inmates and their free family members when they can never be certain about parole. That lack of certainty on freedom is in many ways unconstitutional. Furthermore, the recent points system introduced a scintilla of clarity in the process only, still leaving the actual predictability of freedom for a parole eligible offender completely dark. What is clear is that there has been no progress to close the distance between knowing the offender and a detached BPP. There is no possible way for any BPP member to know the inmate in a fashion anywhere close to Prison Staffers; it is a human crime that TDCJ employees who have supervised a given inmate for the last ten (10) years or more and that supervision be totally absent in the parole process. That is common human knowledge. Adding 1% of Certainty would allow HOPE in the inmate and HOPE in the inmate’s family to flow like a river and affect the inmate’s behavior. Additionally, this would become a true resource of up-beat morale for the staff who would become part of – integral – to an inmate’s freedom. It has been said, “It takes a Village to raise a child,” and it about time to use that in prison. Imagine — the local prison employees possessing a 1% voice in an inmate’s freedom based upon behavior. This Village Valuing of Behavior would revolutionize prison and lift family values. There is no appreciable argument against it! 2. Security and Inmate Work Ethic. If an inmate knows that by law and in reality and in actual practice his behavior in prison, even his attitude toward the Prison Staff will directly affect his parole, such would improve both his productivity and relationships categorically, in turn, positively impacting facility security, even how inmates walk to chow. 3. Reduce Recidivism. We have a problem. The huge recidivism rate is directly linked to the PBB’s choices, and the BPP are not decreasing recidivism with their choices; worse, no fault of themselves, because of the 100% of Uncertainty about decisions, there will never be a way to track recidivism effectiveness, much less efficiency. What use is a point system discretion that cannot be tracked? That does not improve recidivism? Can the quality of their discretion be measured outside the recidivism rate? No! Whatever talent or paperwork they possess, even each BPP member would freely admit, none of them are any smarter or any more educated – they are just men and women like us all. Yet, the 1% Certainty Model would be tractable because of the certainty. Yet the crux is that the esteemed BPP cannot and will never have a more finely tuned intuition than the Prison Staff regarding an inmate – that, too, is absolutely certain. More to the crux, the BPP member almost never has a single hour’s experience face to face. With no face-to-face experience, the BPP member’s choice is nearly totally inhuman. The Mothers’ Option can prove its reduction in recidivism with clarity, based upon a good relationship and the character that the inmate himself maintains for years. 4. Cost Near Nothing. Since most of the TDCJ’s prisons have parole officers staffed on the unit, there would be little initial cost in identifying the Parole Eligible offenders. 5. Common Sense Corrects Obvious Malady. TDCJ staff and inmates face a ubiquitous human malady and source of nonsense when an inmate trustee serves 120-170% of his time (sum of flat, good, and work time) and works like a champion for years but whose parole is set-off and postponed two, three, and four times. For what reason? – only God knows the full contents of gray area other than the BPP member’s written sentence of rationale! The inmate or his family is not even appraised of the odds of freedom, not even up to the honor and openness of the Texas lottery odds of winning. And Prison Staff – nothing whatsoever, though, as human beings, the staff has supervised the inmate for years, an inherently inhuman adventure. Freedom should not be 100% UNCERTAIN; there SHOULD be at least 1% Certainty decided upon in-prison behavior. Common Sense is introduced when an inmate becomes Parole Eligible in a 2,000-man prison, and 1% will be freed every year, that is a clear chance – 20/2,000 or 1/100 every year – of parole simply because the Prison Staff says “yes” based upon behavior. 6. Reentry Reality Training Corrects Prime Prison Failure. An inmate who believes his actions and his prison relationships actually contribute to his parole release is more likely to believe the same when in free society, for that is closer to the way the free world actually works. Therein, Bennett’s prime failure is addressed: the prisoner is “taught to use liberty wisely” while being “deprived of it.” The only way that Bennett’s prime failure of prison can be addressed is with 1% Certainty in parole given by Prison Staff among eligible offenders. Currently, there is no reality training where 100% of the choice rests with distant PBB member, who, even with the highest honor cannot truly know the offender. The current system demolishes reality training and sows despair, but the Mother’s Option fosters reality and reaps hope. 7. Appendix 1: Texas Double Jeopardy and Chart 1: PBB 10-Minute Decisions, I detail the Double Jeopardy that a BPP member commits when encountering past crimes in parole decisions; thousands of hours of criminal investigation, arraignment, and the court drama between prosecutor and defense attorney, and finally the judge and jury’s decision are in reality second guessed by an average of 10 minutes consideration by a BPP member – a super-human responsibility Texas has unfairly placed in the hands of the BPP. Hear this – our precious Jury System is too valuable to be set aside. What a novel insight – the prisoner who truly tries hard gets a better chance at freedom! Better chance than the sloth. The Texas Lottery ought not to be the only thing with clear odds of winning. The 100,000 Mothers’ Option of granting 1% of Certainty in Parole to Eligible Offenders by Prison Staff is valuable to Texas civilization, prison management, inmate rehabilitation, and most precious of all in facilitating family values – even smart on crime. When the distance is shortened between those who decide freedom and who know the inmate and the inmates being freed, therein, TEAM truly means Together Everyone Achieves More. If not us, Texans, then who? If not here, where? If not now, when? This was exceedingly hard to put together, and became a corollary or auxiliary document in support of the more straightforward 100,000 Mothers’ Parole Option that I initiated in 2007. Since then, as best I could, a piece here, a piece there, I have tried to continue to clarify. That effort resulted in a revised version posted in March 2013. It will take some real miracle if this is to take off, but, it seems to me, the need to clarify this is so very obvious. I came to this not by intention, but as the result of years of struggle with another dilemma. After 20 years as senior chaplain of a large prison, as all staffers inside the gate hear perpetually, one prisoner after another will say, at their parole time draws near, “I see parole, I hope I make it” — meaning he will see the unit parole officer to see if the TDCJ Board of Pardons and Paroles (BPP) has granted him parole. For chaplains, this is doubled, as we talk to the family members and connect the family with the prisoners in death and critical illness. Therein, we not only hear the prisoner tell his mother (or family), mostly his mother though, that he is “doing everything he can to come home”—meaning, I am obeying the rules and trying to be a good fellow in prison; the point to be taken deep in the heart here is that the truth of what the prisoner is saying is only known by the Prison Staff of the prison. Moreover, chaplains hear the mothers encouraging, cajoling, begging, and even sometimes scalding the prisoner to “do everything you can,” “obey the rules,” “do what the officials tell you,” “stay out trouble,” and of course, “come home, we need you.” Yes, there are at least 100,000 mothers and grandmothers and often mother figures (aunts and sisters) of prisoners who want their sons to do right, and there are more mothers who are friends of the mothers of prisoners who want the same. Over 100,000 good citizen Texas mothers and grandmothers wonder at the mystery of parole, and every one of them hope their sons will come home as good citizens. Should freedom by mysterious? The chances of winning the Texas lottery are published regularly, even on every single lottery ticket, millions of them. How can winning the Lottery be figured to greater precision than Texas parole? Why? No one, not even the governor can figure out when any Texas inmate will make parole. In the best of worlds, the 163,575 votes cast by the Texas Board of Pardons and Paroles (BPP) in their own FY2009 equal an average of 10.1 minutes of consideration per vote (see Chart 1: BPP 10-Minute Decisions). If the Governor did call – for a friend of a friend – and that call influenced one vote over what a BPP member would have normally done, a kind of moral crime would have taken place. Lady Justice’s blindfold was jerked up a bit by “politics.” That in itself is not so bad or truly abhorrent, for the Governor ought to have some influence. But if the governor did do such, by the awesome power of his office, for any prisoner (and not all prisoners), that is not true justice, especially if the governor did not personally know the prisoner. Yet our case is built upon a greater source of influence vastly closer to the prisoner, even humanly intimate, when one thinks of Prison Staff knowing a prisoner for years. Even the wide margin of percentages between approvals and denials in all of the BPP’s fiscal year reports among the twenty officers and commissioners further illustrate with clarity that there is no clarity or consistency, just a load of decisions made with super-charged speed, even uncanny speed, if not inhumane speed. With such arbitrariness and no certain guidelines that anyone can understand, Lady Justice and the value of freedom take a backseat to a documented whimsy that confounds the mind. 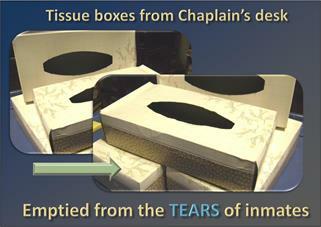 And over 100,000 good mothers’ hearts hurt, and for those hearts there is no appeal. If the absolute obscurity of the process – the darkness itself – was made public, widely public, even its total absence of even 1% of Certainty, would that help? Sure it would. But the reality is that the absolute obscurity and absence of certainty are nearly state secrets, even protected by law, and purposed to remain as much a secret process as possible! Even the purchase of a high-priced high-profile highly successful lawyer will not insure that mother of a better chance at winning the Texas lottery of parole freedom. The huge legal industry kicks Lady Justice in the shin, and 100,000 mothers are in the dark. There is a more intelligent and tractable way. The front end of Texas criminal justice is NOT very mysterious (neither should the rear end be mysterious). At the FRONT, one is innocent until proven guilty, and a lengthy and expensive process insures due process, which can be complicated, but the verdict and punishment are crystal clear. No mystery. “Don’t Mess with Texas” is designed and marketed to be clear. Texas as a rule prides itself in clarity and fairness. Should the rear end of prison life be as clear? Of course it should be – should be clearer – but it is not. Some prisoners work like champs, others loaf along, and some remain rascally criminals. Some remain evil, mean and wicked. There is no amount of paperwork that can truly distinguish the champ from the wise rascal. Without changing the parole system itself, not yet, I have been busy trying to rally support for a novel approach that used to be an ancient practice. The only people who true know the prisoners are the Prison Staff. Allow 1% of Certainty in authority by the Prison Staff to grant parole to eligible prisoners. First called the Warden’s Parole Option, and Maness hopes for popular reasons that the revised 100,000 Mothers’ Parole Option will gain advocacy. I have talked with at least 2,000 mothers in my 20 years as a chaplain, and, inevitably, the hope of coming home arises in chats over death and critical illnesses. Same for all chaplains, and often with other staff who talk with mothers. More than any, mothers want their prisoner children to be good men, and most of the mothers respect the job of the state. The mothers desire their children to avoid trouble in prison. Maness believes that every mother would relish the clarity and simplicity of even a small amount of certainty to parole, and for seven-plus years has been advocating for some authority to be given to each prison’s Prison Staff to determine at least 1% of parole-eligible prisoners to be set free, based solely upon the prisoner’s behavior. There is no better way to improve TDCJ’s mission. At first, this sounds strange to allow the Prison Staff (department heads, officers, staff) to make decisions on parole, but it only sounds strange because of the entrenched apparatus that we call the BPP. The good officers and commissioners of the BPP do their best, but the apparatus itself has been ill, so ill, that from time to time it takes a literal act of the Texas congress to fix a broken cog in the gearing. Usually that broken cog only comes to light after repeated public pressure by advocacy groups that, in themselves, take years to form and years more in lobbying before the “parole Leviathan” can be nudged a single foot forward in clarity, much less certainty, regarding all this. Recollecting these “fixes” would consume a large book (and someone needs to write it). The BPP apparatus is like an old Dodge truck that gets adjusted and repaired, and repaired again, but never overhauled. When people point out in a clear fashion that the truck gets poor gas mileage and can barely pull its own weight up the hill of justice, the only thing that the Texas congress can do, it seems, is just push the truck along and make a new law that puts Duct Tape “fixes” on a truck lumbering forward. III. BPP Fix – Points System Still Dark – and Super Human Tasks! For instance, one of those recent Duct Tape “fixes” happened when the Texas legislature mandated that the BPP come up with a system that helps explain how the BPP members make decisions. This is the 20th century, and it took a law to make the BPP create out of thin air a points system that only vaguely gives a small hint as to how the BPP may possibly have on the whim of their wisdom leaned toward the decision they made. Vague, still, with 100% obscurity to the public and to 100,000 mothers. I think mothers are important here! Freedom needs some certainty – a value I presume all Texans cherish. Don’t blame the BPP for that – no sir! It is the law, the governor, and the Texas Constitution that empowers the BPP, so do NOT blame the BPP for doing what they have been tasked with doing. Only know this, the BPP members and commissioners are NOT super human, though, as we will make abundantly clear, what the law and Texas Constitution has thus far tasked them with doing – in fuller ramifications – is indeed SUPER HUMAN, and often – no fault of themselves – all too often inhuman. Freedom and Lady Justice are more valuable than that. Again, not the good BPP members themselves, but the “apparatus” has grown to the point that it is choking from its own weight. And the BPP are human beings being asked to and even charged into doing super-human tasks! The BPP is charged with doing the IMPOSSIBLE! And when and if the Double Jeopardy is clarified below, then the BPP is charged by the Texas Constitution with also breaking the law of Double Jeopardy, that actually has a legal precedent dating before the state of Texas was a sparkle in Sam Houston’s eye! One example is clear from the BBP’s FY2009 report. 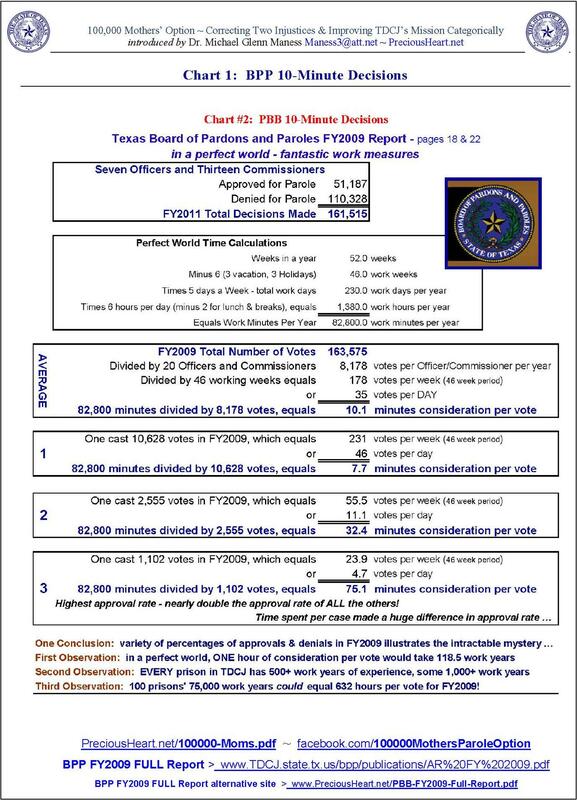 If my math is correct, then in a perfect world, the 163,575 votes that BPP gave in that year turns out be the result of 10.1 minutes of consideration for each vote. That is, in a perfect world, where each BPP member was fully conscientious and gave a perfectly fair assessment and devoted all of their six working hours each day all year round – and no travel – the most time a member could give to a prisoner’s case is ten minutes. Just ten minutes, that is all, to determine whether a man has met some vague guidelines on freedom after he has served his court-mandated time for parole. We will deal with that “court-mandated time” in a moment, but those figures presume a perfect world, locked in a closet with a folder—only ten minutes! See Chart 1: BPP 10-Minute Decisions, which is public knowledge from their own annual reports. This is not a perfect world. We know the BPP members are educated and that the basic qualifications are minimal. There is no requirement that a BPP member need have an advanced degree in anything. Most do not. Many come from areas with no legal or criminal justice experience. The BPP officers are appointed by the governor with good intentions, and the commissioners are hired by the BPP. Good citizens given a good job with enormous responsibilities. None are geniuses, we can assume – can be certain – for if geniuses, they would not be on the BPP, but in the industry of their genius making 10x to 100x their salary. And, be assured, having more fun; for making 163,575 decisions is NO SMALL effort for any group no matter how large. But for twenty persons? – really? The BPP folks – they admit themselves – are no better than most of the other good citizens in Texas. We also know, all of us with certainty, that thousands upon thousands of Texans qualify and would relish the BPP job, even covet the job. The salary and benefits are generous. Nothing wrong with that (except as we shall detail the super-human demands, and then, perhaps, they are not getting enough). We also know and must accept that it is the Governor’s prerogative to appoint the officers; there is no surprise that political affiliations play a role in appointments. In other words, the BPP officers are just good folks like the rest of us, most of which simply knew a friend of a friend of one of the Governor’s many consultants, and – though no one has researched it – perhaps none of the BPP officers had a personal relationship with the Governor prior to appointment. Furthermore, the BPP officers do the same as was done for them, likely, in hiring the twelve BPP commissioners. What does that mean? It means the selection of the eight BPP officers is the simplest part of the entire BPP process, as a process of trust in the governor and his associates serving Texas. Therefore, in this imperfect world, it would be normal for anyone of us who has to push themselves through hundreds of folders a month to get tired and—dare I say—simply run many of the folders saying, “Yes, yes, no, yes, no, no, yes, no, ad nauseam, ahhummmm, let me think about this one, then yes, no, no, yes, etc.” That is HUMAN for such a tedious task, and, sadly, there is no indication that it is otherwise after decades of concern. In this imperfect world and presuming the best of all the BPP officers and commissioners, it is also clear that most of the 163,575 votes did not even get ten minutes worth of consideration. The average of one officer was only seven minutes. Moreover, in the FY2009 report, among its numerous charts, there was not a single indication of how much time any of the members spent face-to-face with the prisoner they were considering to release. Even though part of the job description in the report was to interview prisoners, there was no indication that any BPP member actually saw one single prisoner face-to-face. It is a given – another certainty – that most of the 165,000+ decisions (approved or denied) were made with not even 30 seconds of face-to-face time with the prisoner. How is that justice? It is super-human demands on our good BPP members, for sure. While leading up to the Double Jeopardy, know this. Throughout Texas, the greatest mystery of all is repeated every day in 100,000 mothers’ minds and hearts especially, and less frequently repeated in the minds of others too, including other family members and even TDCJ staff: how on God’s earth can a BPP member make a good decision without even seeing the man face to face? Herein, “paper” has indeed, in fact, been more important than the “human person” in the BPP member’s decision. Remember, no fault of themselves! Ain’t nobody got time for that, to “see” all, except – hear this clearly – the good Prison Staff who have not only SEEN, but have essentially lived day to day and face to face with the prisoner for, in some cases, DECADES! Denying that resource is a human crime, corollary to the crime of solely using a sheet of paper to determine parole without even 15 seconds face to face. Has that been made clear enough yet? Mothers want some certainty and less mystery. They deserve it too, because as good citizens themselves, many of them, are just as qualified to be BPP members. Compounding all of this, and a knocking in the engine of the apparatus that Maness hopes will get more public attention, it is a skipping of justice that we know with greater certainty the chances of a person winning the Texas lottery than we do with a man’s chance of “winning” parole. From the prisoner’s and his mother’s perspective, and from Texas’ perspective, should parole ever – ever – be looked at as “winning” by chance? No! Never! Freedom should never be by chance, but the reality is that chance is the only thing that makes current sense. A person (prisoner, family, Texan) ought to know what it takes to make parole with some certainty. When less than ten minutes is given for each vote, and likely in too many cases less than five minutes, Lady Justice gets another kick in the shin. That is, and therefore, the old Dodge truck’s rattling gets worse as its whole mechanical history comes to light. Texas’ 100,000+ mothers want, deserve, and demand better. All Texans do. We value freedom too much to retain such intractable mystery any longer, to say nothing of the shin kicking of our precious Lady Justice. There is more. For lack of a better term, and perhaps this is the only term, Double Jeopardy is illegal. Once convicted and sentenced, one cannot be charged with the same crime twice. One conviction-with-sentence is enough justice. Yet the BPP in its most recent refinement has clarified how it has, as an institutional apparatus, being committing Double Jeopardy for decades, likely from the beginning. I am surprised every advocacy group has not latched onto this, and perhaps they will. Here is how Double Jeopardy goes. The front end of justice begins with a crime, a victim, evidence, and due process. Skipping probation and focusing upon criminals, those who have offenses that lead to two or more years for a felony, we Texans spend billions dollars and millions of hours of time. At the front end – First Step – a single criminal gets thousands and sometimes a million dollars worth of attention and thousands of hours of time, from evidence collection, victim bills, insurance claims, police investigations, arrest, arraignment, grand jury, and the whole drama of defense and prosecution. In the Second Step of the front end – the MOST PRECIOUS – a judge and jury spend many more hours in court, sometimes days, before a verdict is given. Then a judge or jury sets punishment and off the criminal goes to the hoosegow, the penitentiary, the pen, the big house – to prison. The most precious part of the front end is the Judge and Jury! Here is the crucial point on the front end, not given much thought today, but as common as the Texas sunrise—the punishment includes parole! I cannot overstate this, and it needs some drilling. For as soon as we can drill this properly, every prisoner advocacy group in Texas ought to come on board. But the most important group is also the most reticent and often left out of consideration: the 100,000+ mothers. I say this, because it was the mothers that brought this issue to my attention, though indirectly and unconsciously, by virtue of their compassion. It is rather sad that a prison chaplain is bringing this issue of Double Jeopardy to light, instead of the legislators and BPP, and not quite as sad, but better late than never if the advocacy groups will really help. So let me state this clearly. Everyone knows that punishment includes parole in Texas. When the judge and especially the jury (of similar qualification as any BPP member) are considering punishment, they are also considering parole. The prosecutor under manifold pressures upon his time and “cost” to the court throughout Texas and the U.S. makes Plea Bargains as a common practice that include parole eligibility in a powerful selling point! Who does not know this? Parole eligibility is a factor for ALL, prosecutor, defense, judge, and most importantly the jury – and every plea bargain in between. Let’s be clear. When a judge or jury is deciding upon punishment, they know that a five-year sentence is five years with the “possibility of parole” in two years. If the prisoner does good in prison, he will have a chance of parole, and that is part of the judge and jury’s consideration. The thought processes of the human mind here are not hard to discern. Depending upon hundreds and often thousands of additional hours of work by dozens of people prior to the trail, that become evidence for the trail, and then upon hundreds and sometimes thousands of hours of work during the trail by many people – how much work is given? The “cost” of this is often calculated by economists, too, but who has yet to calculate the more important part?—the time it takes to do all of these prior to the most precious part, the judge and jury’s decision. That time is the justice system’s heart, most preciously within the mind and heart of the jury who struggle between “punishment” and “mercy” to weigh in the “balance of justice” whether to give 2, 5, 10, 20, or 45 years time-to-serve. And a good portion of that TIME is rattled around parole eligibility, if even in a plea bargain and legal drama lawyers so nobly battle. But our focus is on a smaller and critical and precious part of our great free government – the MOST precious part – in that the judge and jury themselves spend dozens and sometimes hundreds of hours to render punishment that in Texas includes parole. No whim of a dictator for the USA. No whim or wimp for Texas. Truly, “Don’t Mess with Texas” is some kind of decisiveness that we take pride in, implying with great advertising and sharp-looking Texas State Troopers ready to enforce – some things are certain in Texas. How about 1% in parole? Yet, Lady Justice buckles with another kick to the shin when Double Jeopardy has been going on for decades and is even spelled out on the internet at the Texas BPP web site. The BPP points system that attempts to help to explain how the BPP members decide the “risk factor” of prisoners is a Double Jeopardy system at its heart of hearts. Again, no fault of the good BPP members themselves, for they did NOT create their board. Worse, the points system was a methodology that the Texas legislature forced upon the BPP by public demand to decrease the hitherto fore absolute intractability of the mystery of who wins the lottery ticket of freedom in parole. Prior to the points system, the decision was solely in the minds of good and rather innocent BPP members for decades. Now with the points system, we can see that one prisoner is a higher risk than another based upon what? Yes, Double Jeopardy in essence. Yes, based upon five minutes of consideration of what the prisoner has already been tried for, and some other paperwork! Double Jeopardy for decades, lately forced into greater light by the Texas legislature, as the BPP was forced to “fix” or Duct Taping its own mystery; their “clarifying” in their points system is as much a mystery as before, and no real fix at all. We still have no clarity, no certainty, only 100% uncertainty prior to a BPP decision. Yet, even today with the points system, we have only the reason for denial, and still no resolution to the mystery of how a prisoner will make or earn or be granted parole. Not the governor or any person in Texas can figure out how a person is going to make parole or not, not even up to the clarity that we have in the chances of winning the Texas Lottery. And the fixing of the entire apparatus is not going to happen in this article either. What is so crucial to justice is that we must see that the current BPP is committing Double Jeopardy. They are second guessing the judge and jury that spent hundreds (or thousands) of hours analyzing as part of a sophisticated trail process (costing billions) that gave a specific punishment that included parole – and second guessing all within five minutes of consideration – super-human demands no person should be forced to do. Let’s clarify more. When any BPP member uses the crime committed in determining parole, they commit Double Jeopardy. Yet, every BPP decision includes not only the crime committed, but also the how serious the crime was. At first blush, one might think that normal, and it has been the norm. The BPP are made up of us normal folks after all. But the current apparatus is broken here. No BPP member has the super-human ability to review any crime well in ten minutes, much less go backwards in time ten or fifteen years and revisit the hundreds of hours of court time that a judge and jury went through to arrive at the punishment that included parole. The punishment would have been different if there was no parole in Texas. Said in another way, a man with a small criminal history assaults and robs a victim, and the jury spends hours in trail and is given instructions by a judge. The judge and jury debate and decide punishment according to the laws of Texas, and determine the man will serve five years, being eligible for parole in three years. That same jury would only sentence the man to three or four years if no parole was available. The availability of parole is a crucial part of the punishment by a jury, and – hear this – the jury NEVER includes ANY of the future BPP options and NONE of the vast treatment options that come and go like a sea gulls over the ocean coast. It is IMPORTANT to note that the judge and – most precious – the jury never takes into consideration the future BPP process in JUDGMENT. In the judge and jury’s mind, the verdict is meant to punish the man for a time in prison with simple parole options; if he does good in prison, he can go home on parole. The clarity at the Front End is not at the Rear End. There needs to be far more certainty, if Lady Justice is to stand tall – even 1% Certainty that can be obtained with Prison Staff choosing, not by suggestion, nor by recommendation, but by deciding among 100s of prisoners which ones go home. Indeed, 100,000 mothers agree that their children needed punishment. The jury did too, and meted it out with the understanding that if the prisoner did well in prison, he would not have to serve his whole sentence. Even the good BPP will agree: it is not the BPP’s job to second guess the original jury’s determination. Yet, that is what the BPP is tasked with doing; its points system clarifies its own committing of Double Jeopardy. The BPP are NOT super-human enough to evaluate ALL the judge and jury looked at years prior in 10 minutes! In truth, a harder pill to swallow is this: any consideration at all of the original crime in determining parole eligibility is a form of Double Jeopardy. Worse, the BPP cannot do it! Worst of all, the BPP were not there in the precious jury’s shoes. I say precious, because the focal point and preciousness of our entire legal system is and ought to be the jury—freedom is a jury’s duty most of all, not the BPP’s duty. If we can truly evolve, the BPP will have challenge enough to evaluate its 165,000 decisions based upon the prisoner’s in-prison behavior. Expecting the BPP to evaluate BOTH the original crime, often decades ago, second guessing the judge and jury is not only impossible, but even far and away from the task of “parole” itself, meaning in itself, “release from prison” at the least from good in-prison conduct. That is what normal Texas citizens understand, anyway, and 100,000 mothers most of all. But looking back at the crime is more complicated than looking at the in-prison conduct, and even after all – to do both and look back at the crime in Double Jeopardy AND to consider in-prison behavior AND do all WITHOUT even a face-to-face encounter of five minutes – that is too super-human for any person. When a man reaches his parole eligibility, the only consideration that should go into the five or ten minutes is only and solely how he has spent his time in prison. Nothing of his crime before he was sentenced should play a role in the BPP’s decision, because any such consideration performs Double Jeopardy and cheapens the precious jury determination. By God’s witness, such Double Jeopardy should not take place within five minutes. Such BPP decisions in each of the 163,575 votes disrespect the original judge and jury’s punishment in a big way. That cheapens our entire justice system. One method – ideally – would be for the BPP to make determinations on a case folder based solely on how the inmate acted in prison, with absolutely no knowledge of his original crime. Lady Justice would be truly blind there, and no offense to the original judge or jury would take place. Whatever, we must respect and even protect the original judge and jury’s verdict on punishment that includes parole. If a man did good in prison, he would go free; if he was bad, he would stay in prison. That is a bit simpler and does not take into consideration some rehabilitation options. But we must reconsider the apparatus. True justice in parole must include the Prison Staff in a definitive and decisive way in parole based upon their huge irreplaceable experience of prisoner behavior! As mentioned, when a prisoners knows his actions in prison affect his release, reality and more is congruent, and so much more – revolution in prison effectiveness is on the horizon. The entire apparatus needs an overhaul, and that is another subject altogether. Without junking the old Dodge truck, or even affecting the current BPP apparatus, there is a way to bring alongside the truck a new vehicle of justice that will accomplish the BPP mission with little clutter and smog. That is, with no Double Jeopardy and with much more time to consider the prisoner’s person, each Prison Staff in each facility in TDCJ has literally 500 to 1,000 years of correctional experience. When a prisoner has spent ten years in a single prison, literally hundreds of employees have observed the prisoner for those ten years. That is a resource too rich to fail to utilize. We must utilize it. By accessing Prison Staff and decreasing Double Jeopardy, we advance justice and add value to our cherished adjudication valuing to high heaven the original judge and jury’s hard-wrought verdict and punishment. We must value the jury’s decision that included parole in Texas. First published as “Warden’s Parole Option” in 2-15-2007; presented again to the 82nd Legislature, House Committee on Corrections and others on 4-13-11, with attached data on Board of Pardons and Paroles in relation to HB 3365/3340 first sponsored by Rep. James White, herein, revised March 30, 2013. James V. Bennett, I Chose Prison (NY: Alfred A. Knopf, 1970; 1st Edition): 11. As hard as that was, where is the history of that decision? Has anyone been tracking it? The esteemed BPP members don’t have the time to track it. Alternative site: www.PreciousHeart.net/PBB-FY2009-Full-Report.pdf < in case it was deleted.